Original Content: Young Readers And eBooks: How's That Working? Earlier this month, I wrote about one of the benefits of eBook publishing. Digital books don't take up space in bookstores or warehouses and, presumably, will have a bigger window for finding a readership. Paper-and-ink books disappear in months, because they do take up space in bookstores and warehouses. Digital publishing looks attractive for that reason. It looks particularly attractive for republishing out-of-print books like Saving the Planet & Stuff. An eBook can remain available indefinitely no matter how well it sells. It can attract some sales, at any rate. What About Digital Publishing And Children's Books? About two and a half years ago, I took part in a New Media Day with the NESCBWI. The general feeling was that eBook publishing was coming in big time. We were told by a speaker in the morning that YA was the dominant child category in both self-publishing and eBooks because young kids were less likely to have e-readers and picture books can be more difficult to create digitally. 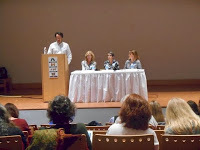 I was part of an afternoon panel of authors who had republished out-of-print books. There was interest even though none of us were making much in the way of sales. Children Aren't Reading eBooks. Middle-aged Women Are. Evidently, there was a logical reason for what those of us who had republished our work ourselves as eBooks were experiencing. It wasn't just that children don't have e-readers and art work is hard to digitize. A study sponsored by Kobo, which publishes eBooks, "suggests that women represent 75% of the most active e-readers – defined as readers who spend at least 30 minutes a day using electronic books." What's more, a large percentage of those women are over 45. A 2015 UK study came up with similar findings. In my personal experience, the young people I know (teens into thirties) read, but not eBooks. Middle aged women who are serious readers are the people I know who use e-readers. They want books fast, and they aren't interested in books as artifacts. Paper-and-ink books are just something to take care of. What Does This Mean For Children's Authors? It may be too soon to embrace eBooks for child readers. There just may not be child readers out there for eBooks now. I own the rights to four more of my books. I'm not rushing to republish them as eBooks. Hey, doesn't this sound like a great time to remind my blog readers that Saving the Planet & Stuff will be free for Kindle users this Thursday, Friday, and Saturday? It will be a great opportunity for all you women readers of a certain age to get it. And if you're a Kindle user who is not a woman of a certain age, you're welcome to a copy, too. I fall into your demographic of who is reading eBooks, and I do read them a fair bit. I love them for travel, and for grabbing the latest new fiction while I'm reading in bed. I actually don't let my six year old read eBooks at all - I want her to have less time on-screen, and I just feel instinctively that it's better for her to read print books. I love mine for doctors' office waiting rooms. I also think eBooks are great for book/author discoverability. I pick up the eBook editions of books I'm interested in or work by authors I'm interested when I see it go on sale for Kindle. If I like it, I can get follow-up books immediately. I shop for books in bed with my Kindle. I don't know how I'd feel about the child/read on-line issue, if I had to deal with it. My kids were older when the Internet came into their lives, but there were no eBooks then. We used to make them earn their Internet time. I can't remember what the formula was. But that limited their access.